Why: For those of you that don’t already know, one of our (Evan’s) favorite stories from childhood was Sideway Stories from Wayside School. Fast forward a couple decades, give or take one or two, and we find out that the genius behind literature’s most infamous 30 story school building wrote several other popular YA novels. Who knew? Well, not us. It goes without saying that we could hardly contain our excitement (actually, Evan didn’t contain his excitement, which resulted in a rather unpleasant experience at the library). What a great young adult novel! There was action, adventure, friendship and a fair number of scorpions. We loved how the plot wove separate tales involving Stanley’s family history and connected them seamlessly to add depth to the resolution. We loved the various personalities at Camp Green Lake despite our distaste for some of the campers and counselors. We loved the villainous Warden and Stanley’s eccentric father. Okay, we’ll be done with the love-fest. 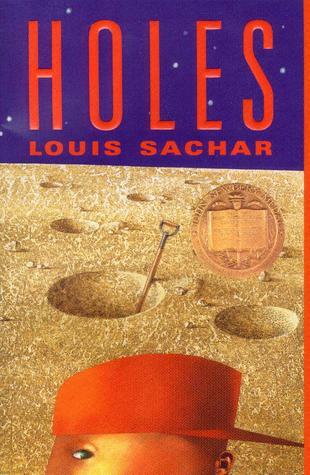 Holes represents YA literature at its finest and after you read the novel check out Shia LaBeouf in the not too terrible movie adaptation. I finished Swallows and Amazons yesterday and this morning I was ready to start in on Tuck, the last book in Lawhead's trilogy based on the Robin Hood legend, but Tuck must be in a box somewhere in the garage because I couldn't find it. What I did find was Holes, the copy you gave Jack for his birthday. I just finished it. It was uh-MAY-zing! Couldn't put it down. My socks have been successfully rocked.